It is once again time for a Stick It Down double page reveal. This is also my last reveal for this term, and I will be going on a bit of a design team hiatus after. Life gets a little busy for me from August through October, and I still have a ton of UFOs (Un-Finished Objects) from past scrappy trips I would like to work through. So, with limited crafting time ahead, it was time to take a break. That being said, I have had a sneak peek of the upcoming sketches and they are AMAZING! So, here is my final (for now!) reveal for Stick It Down. I stuck to using the Summer Sun collection pack from Fancy Pants to scrapbook pictures from our first trip to Cuba. The cardstock is Stampin’ UP!, the enamel dots are Bella Blvd, the twine is American Crafts, and the washi is from my stash. I have really loved playing with this collection. Thank you to all for joining me on this fun Stick It Down journey! Thank you to the awesome crew at Stick It Down for being so welcoming and supportive. It has been a pleasure creating with you. Do hop on over to the Stick It Down blog and see what the rest of the team has created for your June inspiration. I happen to know that if you link up your creations with us you have a chance to win a prize or be an upcoming featured designer! As always, I can’t wait to see what you create. Hello and happy May! Saturday was National Scrapbook Day so I hope you found some time to be crafty this weekend! It’s time for the Stick It Down double page team reveal for this month. I added some quilt style stitching around the patterned paper sidebars to continue the quilting and vintage feel. The title was cut on the Silhouette and then some Wink of Stella red glitter was added over top. Some photo stickers were added from the Simple Stories 24/7 collection as they have a similar colour palette. And finally the page was finished off with some stamping, journaling, pearls, clear button, and twine. The paper, flowers, pearls, button and twine are all Bazzill. The stamps are Stampin’ UP! and American Crafts Dear Lizzy. The ink is Close To My Heart. Hop on over to the Stick It Down blog and see what the rest of the team has created for your inspiration, and then join us in any or all of the sketch challenges for the month. Linking up gives you a chance to win a prize, or to be a monthly featured designer. As always, I can’t wait to see what you create this month! Happy April everybody! It’s time for my Stick It Down double page reveal. I used papers from Teresa Collins, Studio Calico and American crafts. The cut file I made myself on the Silhouette. The photo stickers are by Simple Stories. The phrase stickers are Tim Holtz. The mists are Heidi Swapp Color Shine. And the 3 little gems are by Teresa Collins. As for the pictures, one view is of one of the towers at Aria, a pool selfie where I spend a few hours every day until I need to escape the heat, the spectacular brioche french toast and bottomless rosé from brunch at Bardot, and the super cool tequila wall at Javiers. Here is the sketch for this month so you can join us over at Stick It Down for a chance to win a prize, or be a featured designer! Fun! Check out their blog today to see what the rest of the double page team has created for your inspiration. As always, I can’t wait to see what you create! I am thrilled to be back with Stick It Down this month after missing last month. Thank you to the wonderful team at Stick It Down for being so supportive as I looked after some family matters. I did eventually complete February’s layout and will post it at some point. March is also the month where I am the featured designer for the Stick It Down double page team! (no pressure!) 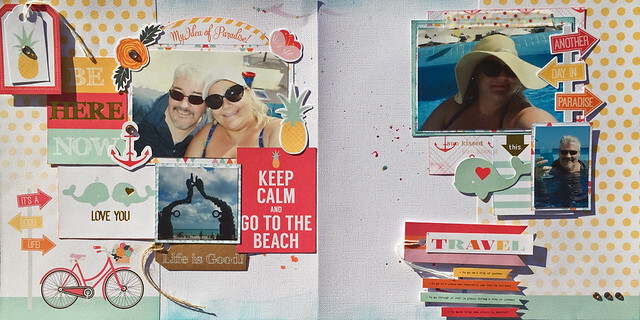 We have a really fun layout for your double page scrapbook inspiration. Once again I took a few liberties with the sketch and had a little bit of fun with it. 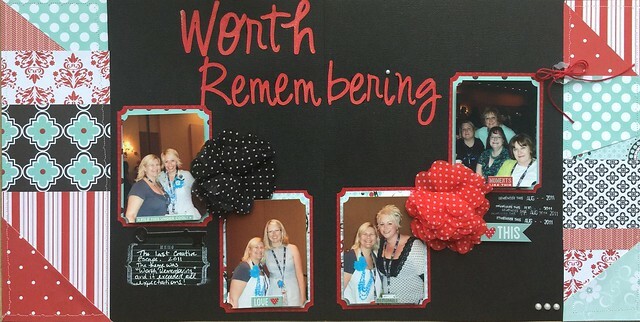 I opted to stick with photo and embellishment clusters like in the sketch, but used a bunch of journaling cards and changed the sizes of the elements to work for me. I worked with the Fancy Pants Summer Sun collection that I picked up at ScrapFest last year. I just love the dreamy colour palette and all the fun embellishments that are great for building fun clusters. The paper is also an amazing weight and texture. I used pictures from our amazing January trip to Playa del Carmen and Cancun Mexico. I added in some misting (Heidi Swapp and Tattered Angels) and inking (Tim Holtz), as well as a few fun rhinestones from Recollections. So now it’s your turn! Hop on over to the Stick It Down blog to view the sketches (single page, card AND double page!) and be inspired. To see what the rest of the double page team has created you will want to go back on Monday the 6th to see their reveals! Make sure you share your creations with us by the end of the month for a chance to win a prize AND to be a featured designer for May! I can’t wait to see what you create!